On the 17th April we had a long drive to the above show held in Builth Wells. Our alarm went off at 03:30 - who knew that there were two 3:30's in one day!!! This was Comar's first Championship Show and his longest journey to date. At 8.5 months of age Comar handled the journey quite well which was helped along with a few stops on route. His travelling companion also took the journey well but I must admit they were glad to be home as were we all. It has been a few years since we have done this show and now I know why. 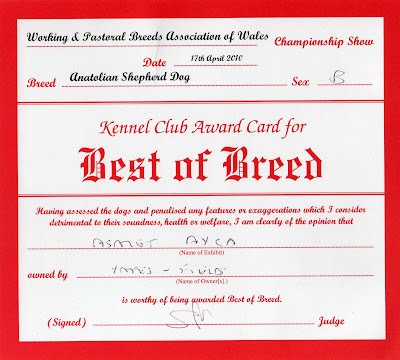 The journey was made worthwhile when Comar was awarded Best Puppy and Ayca was awarded Best of Breed (see certificate below). Many thanks to our judge on the day Mrs J Peak. The above photo of Ulli shows her keeping a watchful eye of her puppy Comar and below is Ayca and Comar fully recovered from their travels.